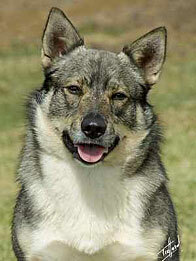 Swedish Vallhunds are also known as Swedish Cattle Dog, Swedish Shepherd and Vasgotaspets, and were originally developed for farming purposes. The origin of the breed is very unclear but its spitz-type looks suggests that it may have originated in the Arctic regions of North. On the other hand, it is believed to have originated in Vikings and is thus also known as the Viking dog. They were and still are used to control vemin, herd cattles and as guard and watch dogs and hence were also referred to as the “little cattle dogs of the Vikings.” It is not an aggressive breed and would simply warn the strangers by barking. They are thus suitable as working farm dogs and companion pets. Swedish Vallhund is a strong, dauntless, dutiful, lively, brainy, amicable and healthy small breed of dog which fit well into the rural surrounding as well as suburban lifestyle. Males of this breed are normally 31.5 cm to 34.5 cm in height and the females are 29.5cm to 32.5 cm in height. They have short legs but should be strong and have a muscular body, weighing in between 9 to 14 kgs. It consists of two coats with the topcoat being close and tight and the undercoat being soft and dense. The coat comes in a variety of colors which includes grey, yellow, brown, red or a combination of any of these colors for eg grayish brown, grayish yellow, reddish brown etc. Back, neck and sides of the body are dark colored whereas the remaining parts of the body are lighter shades of the same color. This breed loves to seek human attention and is very affectionate towards their owners. They always respond to people and are even-tempered but can be wary of strangers and hence must be properly socialized and trained while still a puppy. They are a good guard dogs despite their small size. Due to their inbuilt herding traits, they are also known for heel nipping and this habit may be encouraged for working farm dogs and at the same time discouraged in companion pets. They can compete in various dog sports such as agility, obedience, showmanship, flyball, tracking and herding events. They do not suffer from many known genetically inherited health issues and are thought to be healthy lively breed having a life span of over 14 years. However, due to their short legs, they may suffer from spine illnesses.